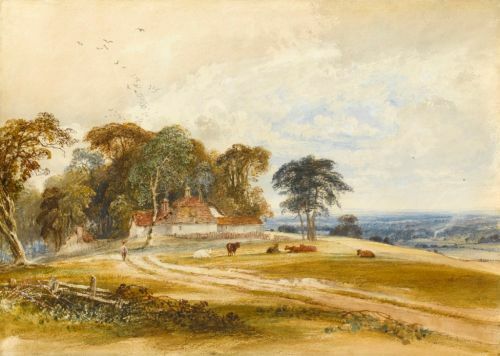 Copley Fielding moved from London to Brighton in 1829 and exhibited a large number of South Downs views from then until his death. Naworth Castle is two miles north-east of Brampton in Cumbria. The castle was originally built by the Dacre family in the thirteenth century and passed into the hands of the Howard family of Castle Howard, through marriage, in the 1560s. Charles Howard was ennobled by Charles II on the restoration of the monarchy in 1660 as the Earl of Carlisle. He amassed an enormous fortune as governor of Jamaica which enabled his grandson, the third Earl, to build Castle Howard. Castle Howard became the main residence of the Earls of Carlisle and in 1844 a fire destroyed most of Naworth Castle. 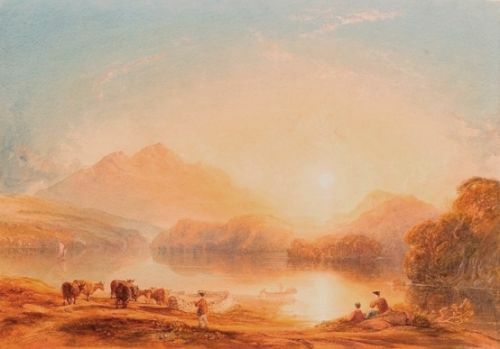 Reconstruction began in the 1850s and this watercolour shows it in its restored state in 1855. 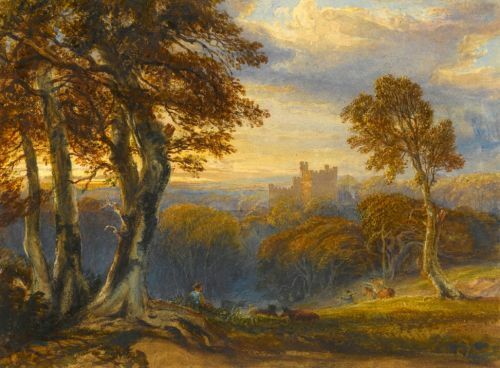 George James Howard, the 9th Earl (1843-1911), an amateur artist and patron of the Arts, lived at Naworth and entertained many important artistic figures of the period. 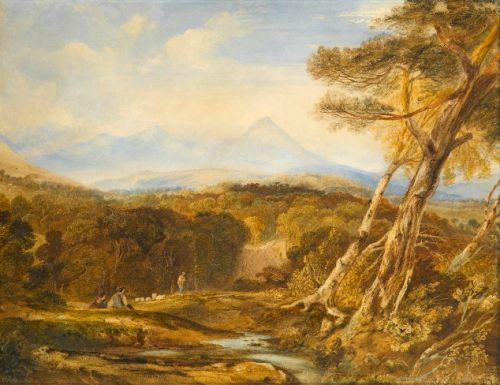 Copley Fielding moved from London to Brighton in 1829 and exhibited a large number of views on the South Downs from then until his death. 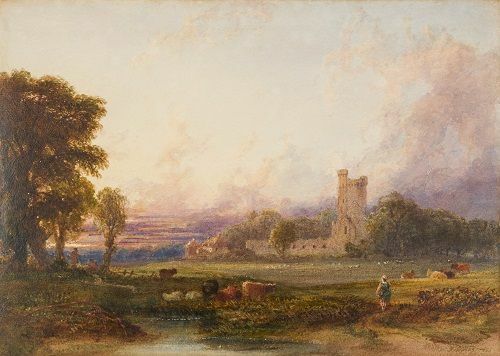 He exhibited a number of views taken at or near Cuckfield at the Royal Watercolour Society in 1845 and 1846. Cuckfield is two miles west of Haywards Heath and fourteen miles north of Brighton. This is a view looking north from Worthing towards Cissbury Ring which is an Iron Age hillfort three miles north of the town. High Salvington windmill is on the top of the hill to the left ? it was a postmill built in 1740 which ceased working in 1897 but has recently been restored. 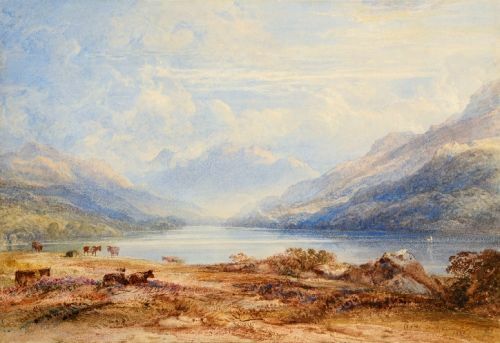 This is a view looking south down Loch Lomond taken from near the village of Ardlui. 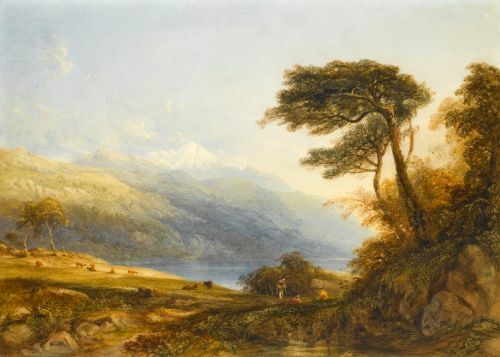 This is an unusual view of the mountains of the Lake District, taken from the north, so it would only have been seen by travellers continuing on to or returning from Scotland. 20.3 by 30.5 cm., 8 by 12 inches. Loch Etive is a long Loch which enters the sea at Connel north of Oban on the west coast of Scotland. This is a view looking north-east to the head of the loch with Ben Trilleachan on the left. 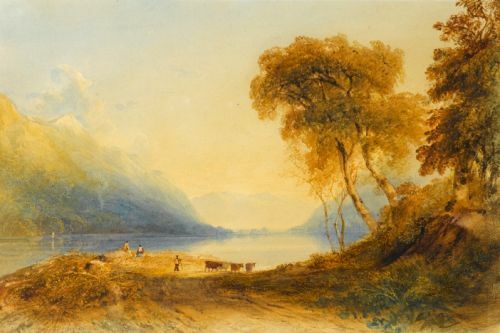 This watercolour is unusual in Copley Fielding’s oeuvre in not being an overtly topographical view and in his dramatic use of perspective. Stylistically it dates from circa 1820. 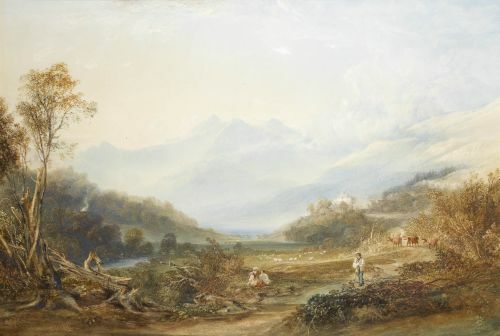 18.2 by 26.6 cm., 7 by 10 ½ in. 25.7 by 36.3 cm., 10 ¼ by 14 ½ in. 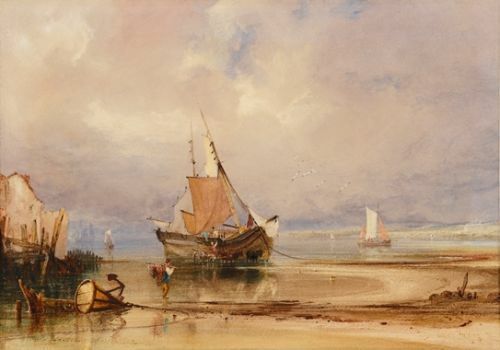 This watercolour was bought at the Old Watercolour Society by John Lewis Brown (d.1836), a Bordeaux wine merchant and an important collector of Bonington's work. 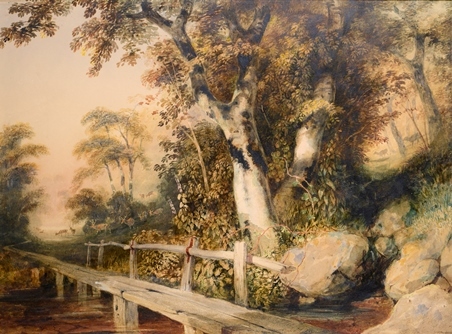 Four auctions of his collection took place between 1835 and 1843.